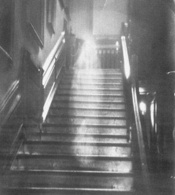 This photo is said to show the "Brown Lady" who haunts Raynham Hall in Norfolk, England. The image was taken by two photographers on assignment for Country Life magazine who said they saw an ethereal form descending the staircase and quickly snapped a picture. It is almost certainly nothing more than a double exposure, though whether done purposefully or by accident is not known. 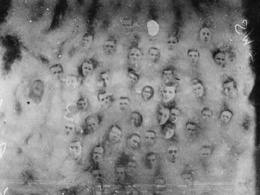 Spiritualists claimed this image showed the spirits of dead war heroes. A newspaper identified the faces as living football players. Image created by William Mumler, 1872. "Bronson Murray in a Trance with the Spirit of Ella Bonner." 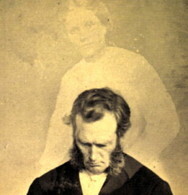 Mumler created the genre of the spirit photo: ghostly images supposedly caught on film.